Make molecular gastronomy dishes at home with this kit and instructional DVD. Dimensions (in packaging): 12" x 6.9" x 3.1"
If you had sodium alginate and calcium salts lying around your kitchen, could you transform liquids into tiny, stunning spheres? Sounds daunting, right? But it’s possible through spherification, a culinary process that shapes a liquid into caviar-like spheres held together by a thin membrane. Spherification is just one technique associated with molecular gastronomy, a modern style of cuisine that encourages chefs to experiment with a wide variety of ingredients and take a scientific approach to cooking. The awe factor is high, but so is the intimidation factor. Jonathan Coutu and Jerome De Champlain aim to change that with a pair of do-it-yourself kits designed to make molecular gastronomy accessible to all us amateur cooks, right in our own kitchens. Jonathan and Jerome are the founders of Molecule-R Flavors, based in Montreal. 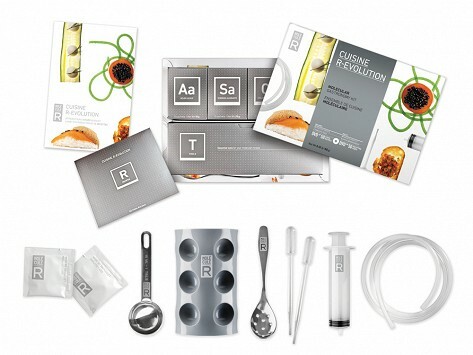 Their Cuisine R-Evolution kit includes five key tools, five kinds of food additives, a DVD with instructions, and 50 recipes for visually stunning and explosively flavorful foods such as raspberry ravioli, arugula spaghetti, and balsamic vinegar pearls. For the bar, there’s Cocktail R-Evolution, a kit focused on the art of molecular mixology. The cocktail kit comes with three tools, five types of additives, an instructional DVD, and 30 recipes that will have you creating layered martinis and serving tequila with lime foam in no time. Prepare to wow your family and friends!